Bubble Chart in Excel (Examples) | How to Create Bubble Chart? A Bubble chart in excel is a visual representation of the relationship of data objects in 3 numeric-data dimensions: The X-axis data, the Y-axis data, and data represented by the Bubble size. 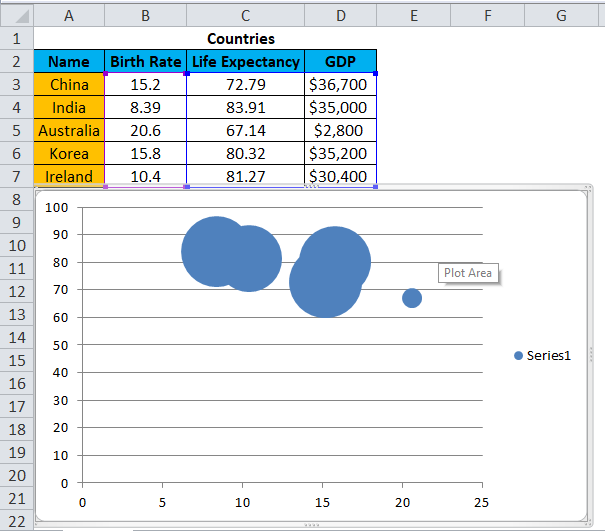 Out of those three data sets used to make the Bubble chart, a Bubble chart in excel shows two axes of the chart in a series of X and Y coordinates and a third set shows the data points(Bubble). 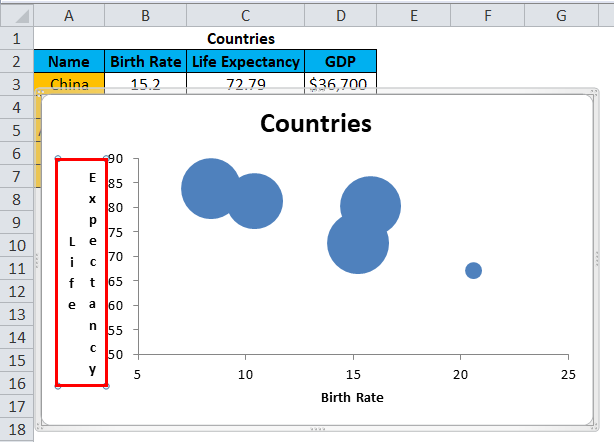 Example: A typical XY Scatter chart might be used to display the relationship between birth rate and life expectancy at birth, with the county as the unit of analysis. If you wished to also express the country’s GDP, you could proportionally enlarge or shrink each plotted data point in the form of a Bubble– so as to simultaneously highlight the relationship between birth rate and life expectancy, but also to highlight the GDP of the countries. Thus, the third value determines the size of the Bubble. 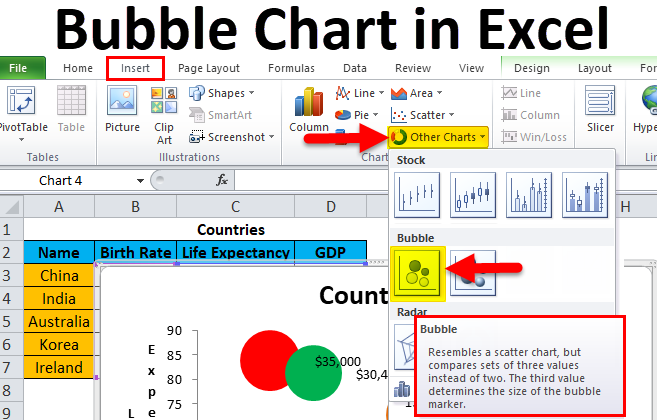 Bubble Charts are available in Excel 2010 and other versions of MS Excel. We can show the relationship between different datasets. They are mostly used in business, social, economic and other fields to study the relationship of data. How to Create a Bubble Chart in Excel? 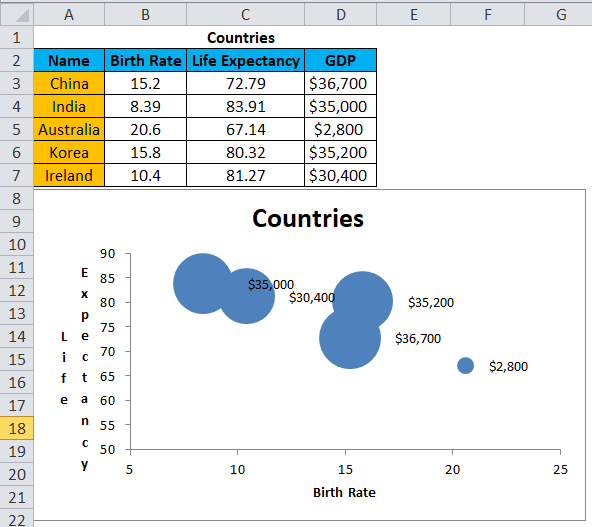 Bubble Chart in excel is very simple and easy to use. 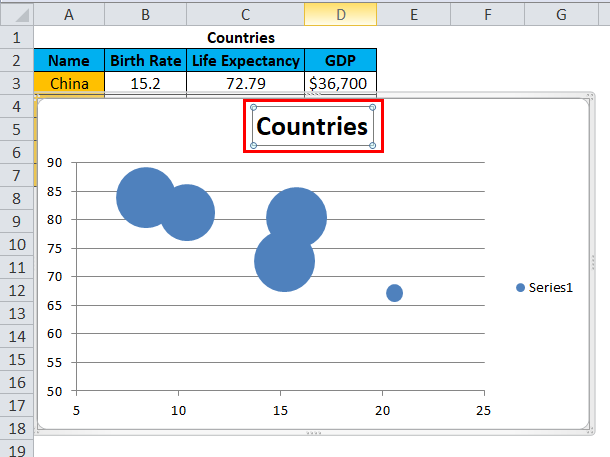 Let us now see how to create Bubble Chart in excel with the help of some examples. 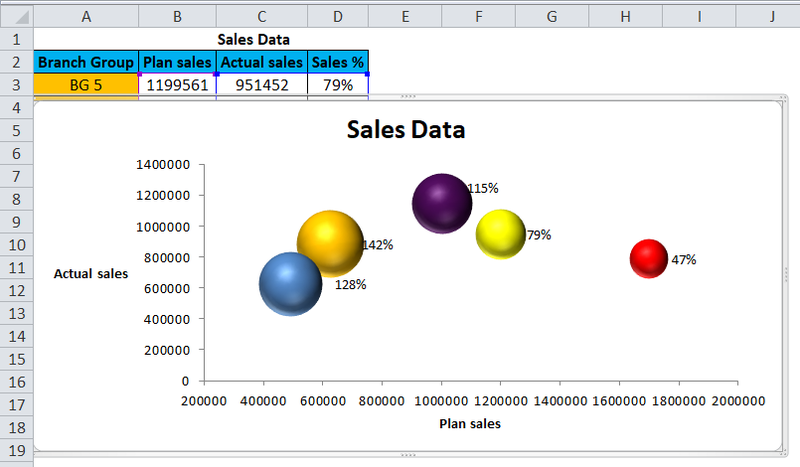 For Bubble chart in excel, we used the example sample worksheet data. 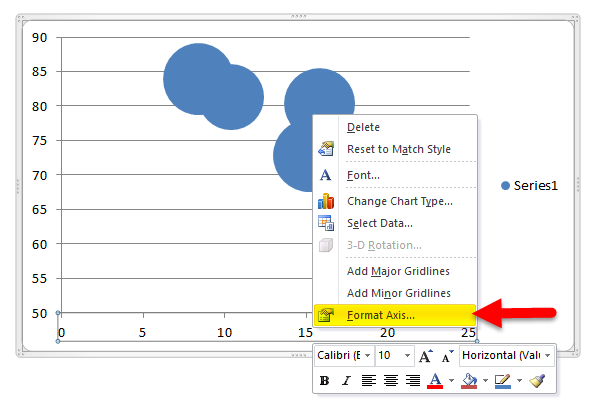 Step 1– Select /create data to create the chart. 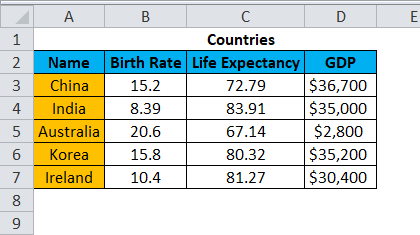 Below is a sample data showing Birth rate, Life expectancy, and GDP of various countries. 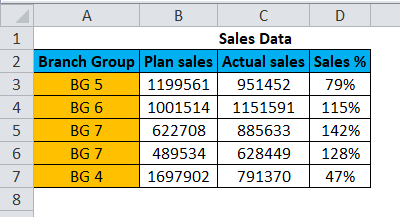 Select the data using CTRL+A. Then go to Insert Tab < Other Charts, click on it. You will see Bubble in the dropdown, select Bubble. Adjacent to that, you also have Bubble with a 3D effect option. I have selected the Bubble option for the below examples. Step 2 – Once you have clicked the “Bubble” option in the drop-down, you see the Bubble chart created as below. Now we need to format this Bubble chart for better understanding and clarity. First, we will select the Y-axis, by clicking on it. 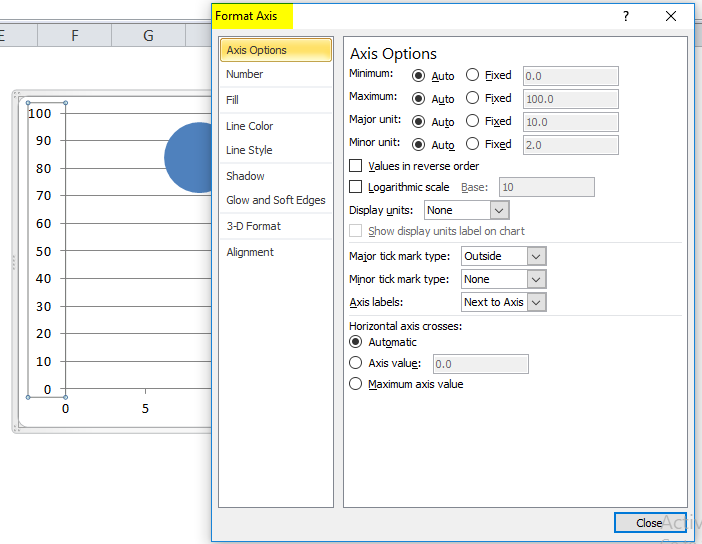 Then we will press right click to get the option, select the last one which is “Format Axis”. Once you click on the “Format Axis”, then the following pop up will open. You then have to change the “Axis Options” from Auto to Fixed as shown below. I have taken a base figure of 50 for Y-Axis (Life Expectancy). Step 3 – Now we need to format the X axis, just like the Y-axis. Select the X-axis by a single click of the mouse. 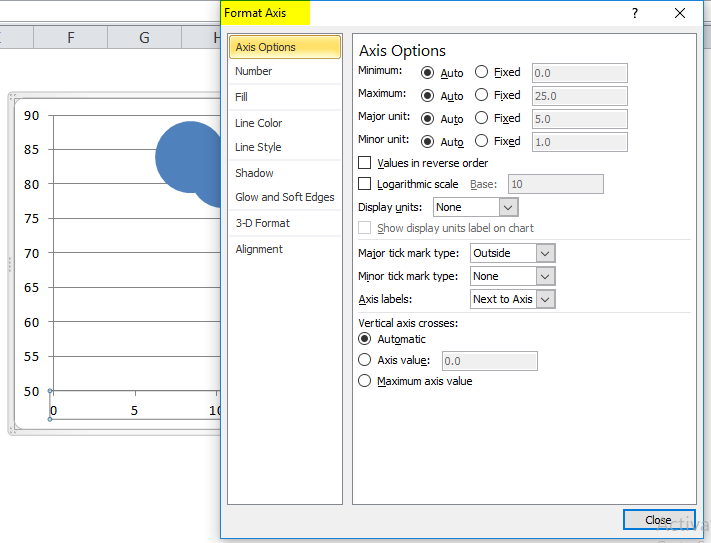 Then right click and select “Format Axis”. Once you click the “Format Axis”, you will get the below pop up. 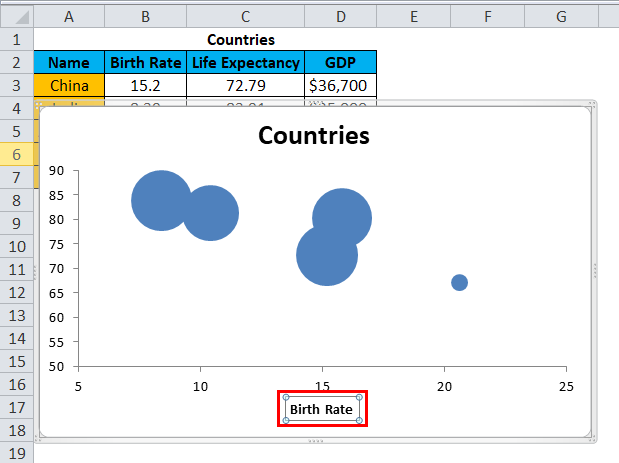 Here also, you have to change the option from Auto to fixed in “Axis options” and set the value to 5 as the base figure for X-axis (Birth Rate). 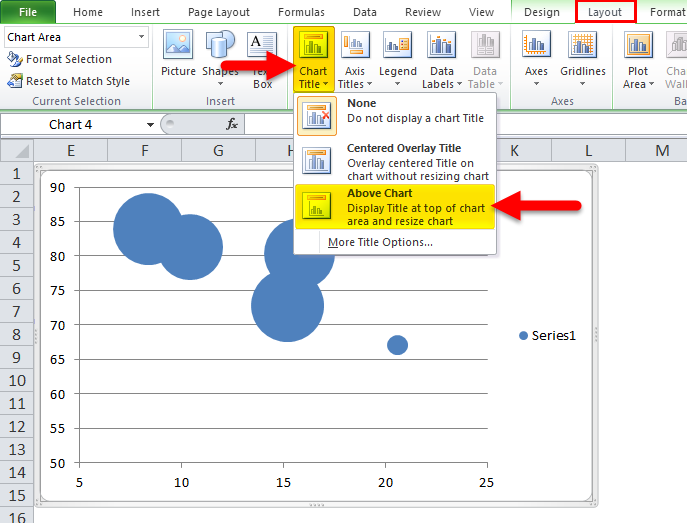 Step 4 – Now we have to add Chart Title and label to our Bubble Chart. For that, we have to reach the Layout tab, and then click “Chart Title”, then “Above Chart”, to place the title above the chart. After Adding Chart Title our Chart look like this. 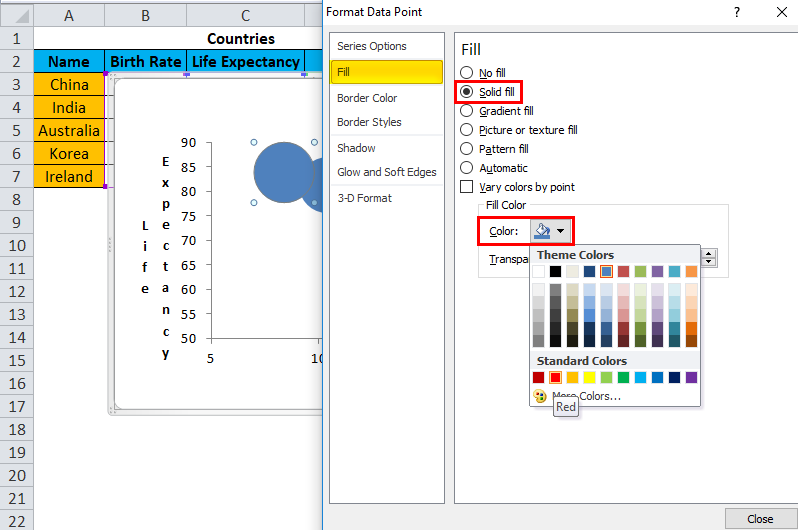 Now select the Chart title on the chart, press =then select “Countries” and press Enter. The chart title now becomes Countries. Step 5 – Now we have to give titles to the X & Y axis. We will start with the X-axis. 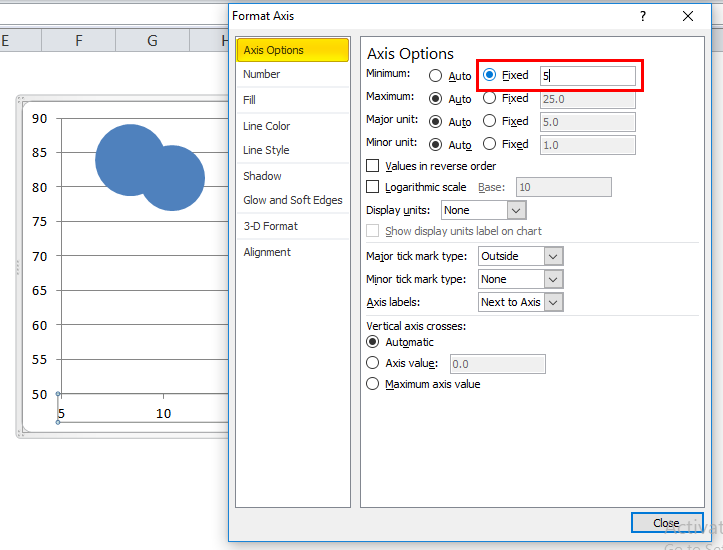 For that reach the Layout tab, select Axis Title then selects “Primary Horizontal Axis Title.” After that Select “Title Below Axis”. Once you have clicked the “Title Below Axis”, you will see “Axis title” below the horizontal axis. 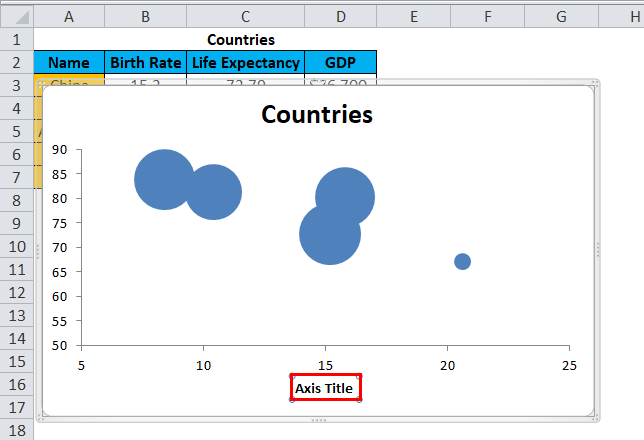 Now select the “Axis Title”, press = and then select Birth Rate, press Enter. The X-axis is now labeled as Birth Rate. Step 6 – We will give title Y axis in the same manner. You will see “Axis title” to the Vertical axis. Now select the “Axis Title”, press = and then select “Life Expectancy”, press Enter. The Y axis is now labeled as Life Expectancy. 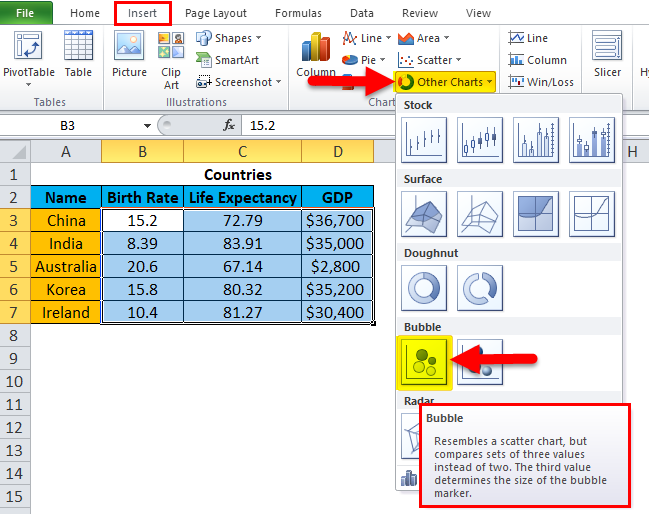 Step 7 – Adding data labels to the chart. For that, we have to select all the Bubbles individually. 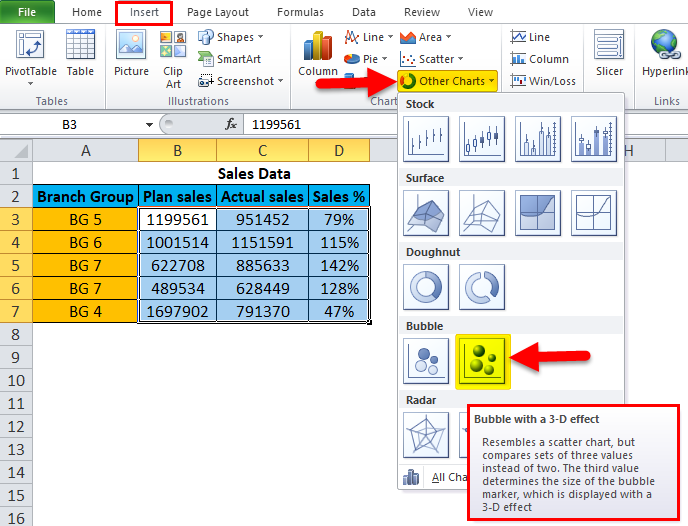 Once you have selected the Bubbles, press right click and Select “Add Data Label”. 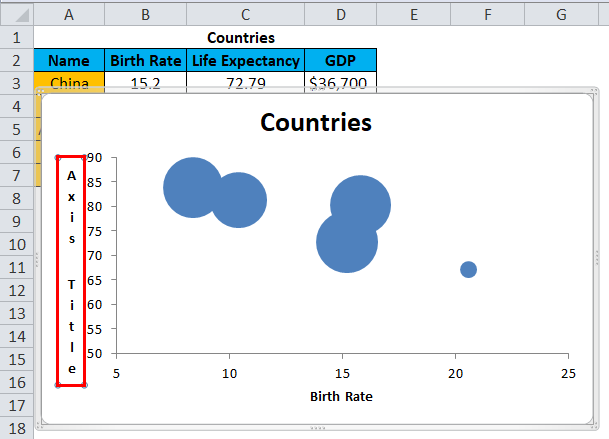 Excel has added the values from life expectancies to these Bubbles but we need the values GDP for the countries. For that, we need to press = and select the GDP relating to the country showing Life expectancy. Example: Select the topmost Bubble which shows 83.91(Life Expectancy) of India, we need to change it to the GDP of India. Press = and then select $35000 which is GDP for India, press Enter. The Bubble now represents the GDP of India. Now, change the Life expectancies to GDP of the respective countries as above one by one. Step 8 – Now to differentiate the Bubbles representing different countries we need to give different colors to each Bubble. This will make the chart easier to understand. 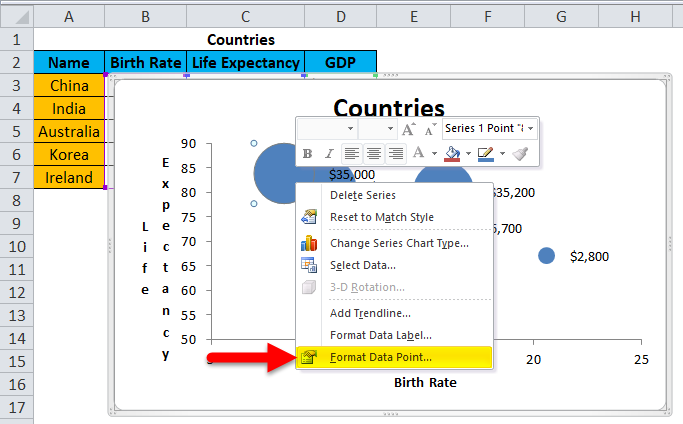 Select a Bubble, right click and click “Format Data Point”. Select each bubble, and fill colors so they can be distinguished from each other. Finally, we have all the bubbles colored differently, representing different countries. 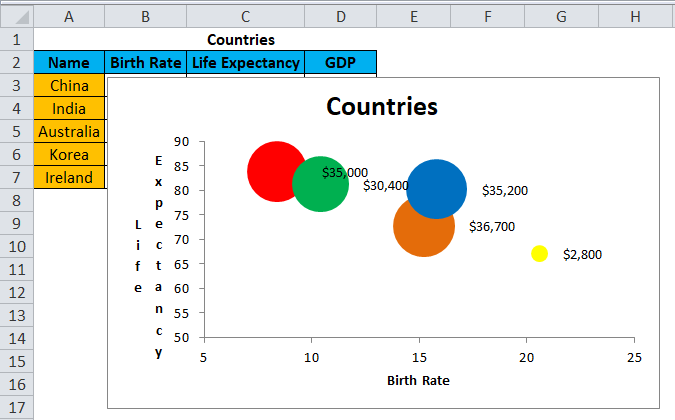 We now have a properly formatted Bubble chart in excel showing, Birth Rate, Life Expectancy and GDP of different countries. This is a Sample data. 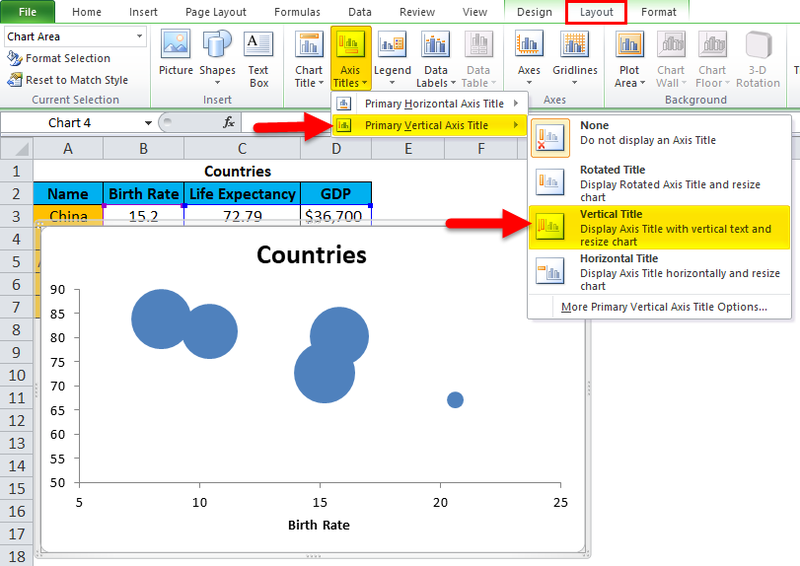 Select the data and now insert bubble chart from the insert section. Once you have clicked the “Bubble with a 3-D effect” option in the drop-down, you see the bubble chart created as below. In the above example, each colored Bubble represents the name of different branch groups. The Chart clearly shows that Branch Group “BG 5” achieved actual sales for 951452 against planned sales of 1199561 and the sales percentage was 79%. Branch group “BG 6” achieved actual sales for 1151591 exceeding the planned sales for 1001514 and the sales percentage was 115%. Branch Group “BG 7” achieves the actuals sales for 885633 against the planned sales for 622708 and sales percentage of 142%, being the highest and so on. 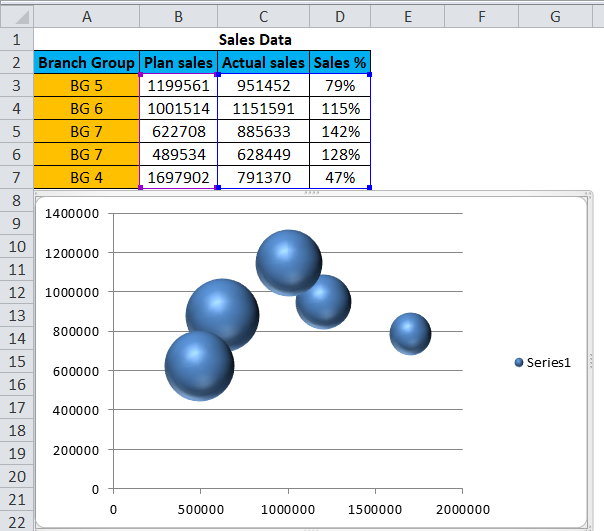 Bubble chart in excel can be applied for 3 dimension data sets. Attractive Bubbles of different sizes will catch the reader’s attention easily. 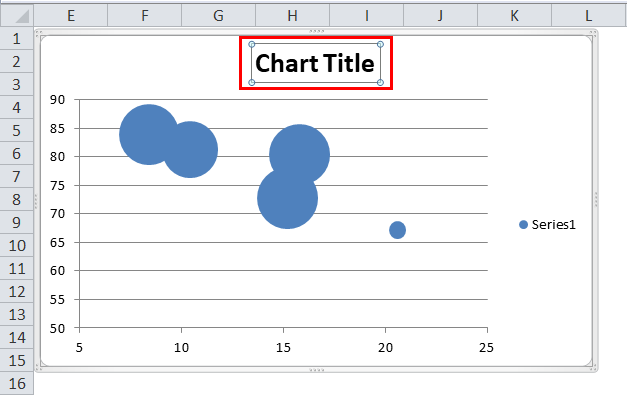 Bubble chart in excel is visually better than the table format. 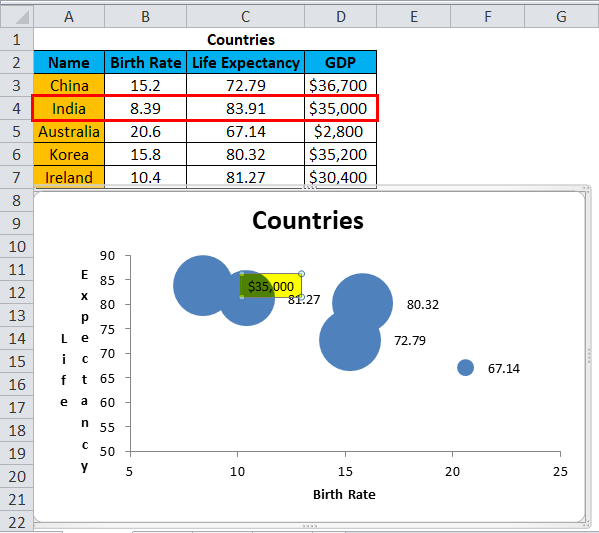 Bubble chart in excel might be difficult for a user to understand the visualization. The size of the Bubble is confusing at times. 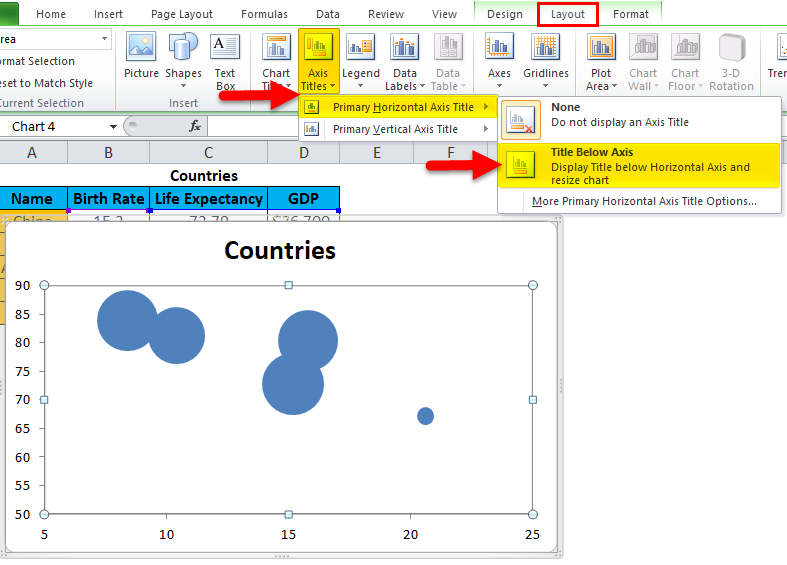 Formatting of Bubble charts and adding data labels for large Bubble graphs is a tiring task in 2010 or earlier versions of Excel. The Bubble may overlap or one may be hidden behind another if two or more data points have similar X & Y values. This is the biggest problem. First, make sure which data set you to want to show as a Bubble. For ease, always format your X & Y axis to a minimum value of the data. Choose colors for the Bubble as per the data. Choosing very bright or gaudy colors may spoil the complete look of the chart. 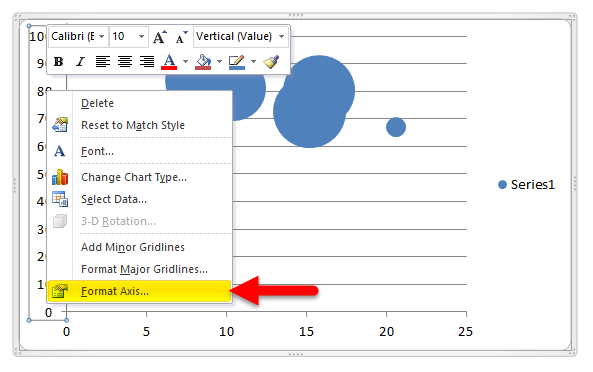 Proper formatting of data labels, axis title, and data point will make the chart easy to comprehend.